New Home with Private Heated Pool in upscale gated community. Amazing Kitchen for those who love to cook, back yard with pool, BBQ, & mini garden. Super large master with balcony, jet tub, TV and Internet. Fast highway access 10 min close to strip, speedway, etc. Great new home with pool in secure gated community with huge master, jet tub, AC, Pool Table. Kitchen is amazing. Dining room, living room, loft, and more. 3400 sq foot home, 5 bedrooms - 4 for sleeping plus games. Casita guest house on property. There are also lazy boy chairs in the loft and two sofas in the living room. Enter gate code to enter community, then use lock box on home to get keys. Owner lives in complex in case of any issue. Pool is private and not shared. Quiet secure upscale community perfect for families or VIP's coming to Vegas to vacation, work, play, or relax by the pool. Here to help if you call - I live on the same street. My assistant Mariah is available to provide butler service. Should you wish for a driver, casino host, chef, personal shopper, babysitter, and more, this can be arranged. Mariah knows everyone in the city, and she can connect you. 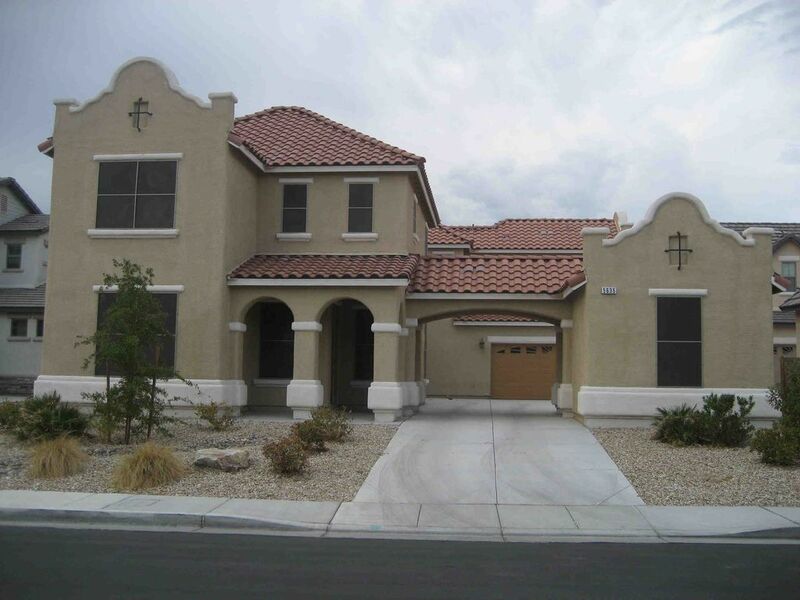 Gated, Security Patrolled, Higher end neighborhood. New development known as the 'mini-castle homes' due to the size of these properties. There are 3 small parks in the community and a giant golf course outside the main gate. Personal car or Rental Car. If you arrive from the airport, Taxi will cost about $60. Express bus line service is outside main gate of property, not recommended with luggage. Within 1 block is Wal-Mart, many smaller stores including CVS, Smith's, McD, KFC, BBQ, Bar and Pub, gas, gym, banks, restaurants, etc. There is a local casino within 5 minutes that includes the Luxury Movie Complex of 16 screens. They serve beer and wine in the theater on lazy boy seats! Amazing. Most rentals are for periods of less than 3 months. Special discounts available for longer rentals, insurance company and executive long term furnished housing. Professional property manager who owns this home. I live on the same street so you can be assured I will take care of your needs. Everyone who has stayed here has told me it was more amazing then the pictures. Fridge with wine and drinks included. Had a great time! Barry was very helpful and easy to work with. My family stayed at the property for spring break and we had a great stay. The home was very spacious. Our group of 13 had plenty of space. Massive house that is close to the strip! We stayed in Las Vegas the 9th and 10 of March to start off our vacation. Barry was an excellent host, he actually owns several homes and upgraded us to a newer version of the same floor plan in the same neighborhood, while he worked on renovations on this home. Either way, I cannot say enough about how nice the entire experience was. The house is massive, with plenty of space and rooms for everyone to sleep on their own bed without having to worry about sleeper sofas or blow up mattresses. Everything was very clean and easy to use. The house is located about 10 minutes from the strip, so it wasn't hard to get anywhere. We had a great experience overall and would love to stay here in the future! It was great, we loved it, however it could have used more blankets and dish towels. Owner Barry was very nice and accommodating by making sure my 50th Birthday stay at his property was everything. Any concerns I had Barry made sure to rectify immediately. Barry went above and beyond to make our stay a pleasant one. I truly recommend making this mini castle your next home away from home stay. The house was very accommodating for the amount of people staying at the house. It would’ve been nice to have additional blankets, pillows, cookware, and cleaning supplies as it seemed difficult to cook for that many people with limited cooking supplies. I anticipated the pool being larger based on the photograph provided. Yesterday our house team went to the property and added extra blankets, extra pillows, extra pots and pans. We want to make sure that every guest has an excellent stay. The pool at this house is not designed for serious lap swimmers. It is designed for guests who want to enjoy being in the water having drinks or for children that want to play in the pool with toys. We also added new pool furniture for guests to enjoy. A new kazeebo is under construction, and should be ready by next week for guests to enjoy. Thank you so much for choosing this excellent Five star luxury home. We look forward to welcoming you again next time you're in Vegas. Gated New High End Luxury Community with Private Security. Homes are spectacular! Huge homes 3500 sq feet with private pool. Everything is close. Strip is 10 minutes away, Next door is golf, shopping, cinema, Wal-Mart, McD, KFC, many restaurants, Hwy access. Just moments from casino and the Nevada Walking Trail. Amazing property - Perfect for Family Rentals. Not suitable for rave or loud outdoor activities. Residential Neighborhood.